Perhaps thinking they’d stepped into a scene from a Studio Ghibli movie, thousands of people in China were pretty shocked when they spotted a “floating city” in the sky. 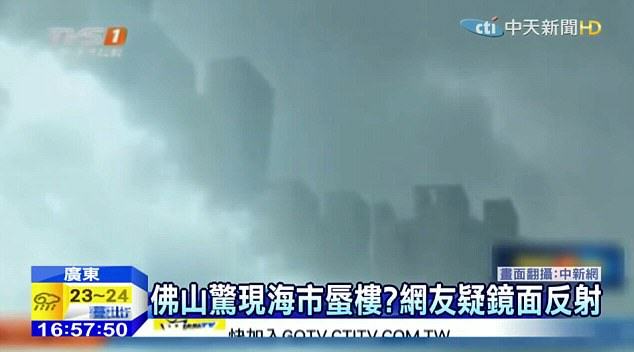 The residents of Jiangxi and Foshan saw the towering skyscrapers emerging from the clouds, prompting theories that they were looking into a parallel universe. The explanation was actually much more straight forward – it was an optical illusion. Weather experts say the phenomenon was due to something called a Fata Morgana – a type of mirage which distorts distant objects significantly. The mirage is caused when rays of light are bent because they’re travelling through different gradients of temperatures after the atmosphere above land or sea has been heated up by the sun. Despite that explanation, conspiracy theorists have had a field day with this one, speculating that the sighting could be the result of a Project Blue Beam test or the government trying out secret holographic technology. Project Blue Beam is a conspiracy theory which claims NASA will one day simulate an alien invasion of Earth or second coming of Christ through holograms.